Paintball is a sport that requires sharp senses and accurate aiming. The paintball gun plays a major role in winning or losing a game. You must be able to rely on it when you aim for an opponent and at the same time to be light enough in order to carry it with ease on the battlefield. Excellence comes with practice. It is important to understand that great equipment can help you, but will never turn you into a pro if you only play from time to time. Tippmann U.S. Army Project Salvo Paintball Marker is a great paintball gun, with beautiful design and useful features. Tippmann U.S. Army Project Salvo Paintball Marker is as reliable and practical as other more expensive marker. It can be easily upgraded so you will be able to use it for many battles. It is made of high-quality materials so you do not need to worry that it will break easily. It is recommended for beginners to intermediate players, but as you can add upgrades it can be as useful for advanced players. It all depends on how much you plan to improve it. Analyzing the customer reviews of this product, it can be seen that it is very accurate, and you can use it as soon as you get it out of the box. It is upgradable, and you can add lasers, flashlights, cameras, grips and others such that can help you improve your playing in any conditions. It has an excellent rating, 4.7 out of 5, based on 48 comments. Analyzing what people have to say about Tippmann U.S. Army Project Salvo Paintball Marker, here are the main pros and cons of choosing such a product. Few people complained about its design as being too long and with short distance firing. Tippmann: Tippmann is a company that provides high-performance paintball guns around the world. It is a leader in this domain. Moreover, it assures specialized accessories that can help you improve your gun in order to use it on a long term. Their quality products are reliable and can be found at an affordable price. Before manufacturing paintball guns, Tippmann produced half-scale replica machine guns. The current products include all the qualities needed in order to be efficient on the battlefield. Features: US Army Paintball Gun is made of aluminum, so it is light weight and easy to maintain. It has a realistic look with great performance and reliability. It has a 6 position collapsible as well as folding stock. The front and rear sights are removable and adjustable to provide greater comfort. The braided hose is made of stainless steel. The picantinny rails allow you to add almost any type of accessory you desire or need. 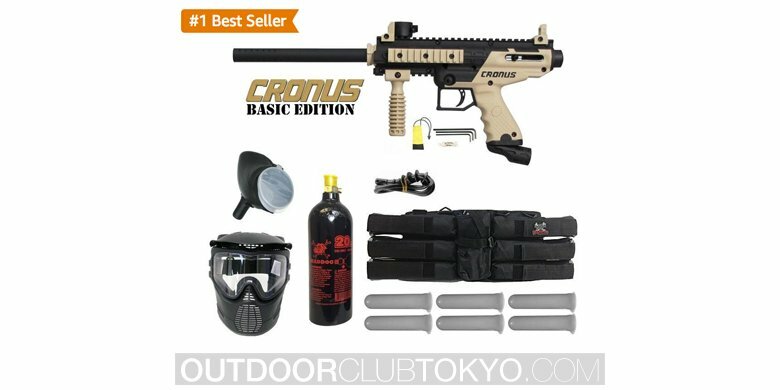 This paintball gun is compatible with US Army E-Grip, Cyclone Feed, 98 custom platinum series response trigger and flat line barrel. Specifications: This great paintball marker works with a .68 caliber. The action is semi-automatic and open bolt blow back. The power/air supply can be: compressed air, nitrogen or CO2. The cycle rate is 8 shots per second. The barrel length is 11”/28 cm. The weight of the marker is only 3.8 lbs. The range is extremely effective: 150+ ft.
Price: Tippmann Project Salvo is a great paintball gun that can be easily upgraded. It is a great choice for beginner and intermediate players and can perform as great for more advanced ones. The aluminum structure makes it very resistant and reliable for a long term. With only $*** you can have a great product that you can fully enjoy on the battlefield. The shipping is absolutely free, so you do not need to worry about additional costs. Overall Project Salvo is a great product for both beginner and intermediate players. The picantinny rails allow you to upgrade easily it with almost any type of accessories. As it is so versatile, you can practically use it as a beginner and gradually upgrade it as you become more advanced. It is a paintball gun that is very sturdy so you will be able to fully enjoy it for many games without worrying that it can break. Furthermore is very easy to maintain and handle so it will last in great conditions for many years.